Writing is, most often, a solo venture, a process worked deep inside the confines of one’s heart and soul. But when two pilgrim poets turn towards each other and embrace the tension that lies between, something new emerges. A writing “pas de deux” is born and the two begin weaving their words together, in and around, over and under, into something bigger than themselves. The writing becomes a lifting, a balancing, a turning…and the words on the page become an Adagio. 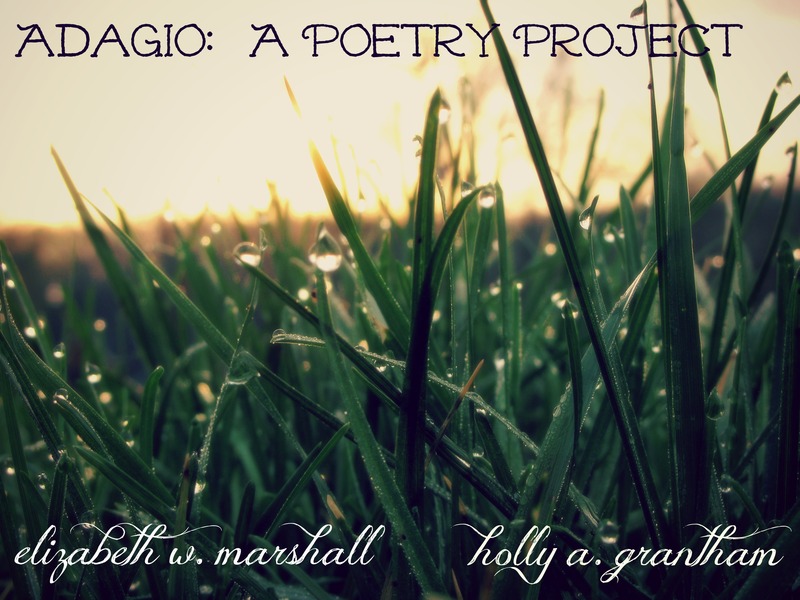 Learn more of the birth of the Adagio project at Holly’s writing home. It is in this spirit that we have threaded together pieces of our souls as our offering to the world of poetry and to fellow poet friends. Most especially, though, we offer it as a gift, and lay it right at the feet of our Creative God who is the Giver of this love of writing and purposeful word weaving. Today we sing this song and tell some of our story…..elizabeth and holly. That is her very crimson rushing pulsing life. And brings up words to stamp white page. She is still and she knows. Her art, like incense to her God. Two pilgrims on a journey. Will you join us as we move in faith on this new poetry journey? And perhaps you might consider partnering with another writer to come along side us in this endeavor? We covet your presence in this space. Holly may be found writing often at her home, A Lifetime of Days. My writing home is here, wynnegraceappears, Elizabeth W. Marshall. We are writing across the distance as our homes are hundreds upon hundreds of miles apart. I’m so excited to read this offering. I know how much each of your blogs means to me, and how dear you are to each other. What a fabulous idea! just a note: the link at the end of this post to Holly’s page links to a random person’s blog. Just thought i’d let you know. Excited to see what you dear ladies do with this gift you’ve been given. Janel, thank you for your encouraging words. And for the heads up on the error in the link. I am grateful. So grateful for your enthusiasm and interest in this poetry offering. Looking forward to what’s to come. Thanks for dropping crumbs of Joy over here. So, did the two of you write this poem together? It is so lovely. I’m intrigued by your writing project, and so encouraged by your love, friendship and shared interest in beautiful writing. Yes, we wove the lines together. It was a joy-filled project. Thank you for your interest in the creative process and your encouragement. We would love to have you join us as we move forward. Looking, watching and listening to see where and how the Lord leads us. How lovely. What an expression of your friendship, love and trust. It is a sacred thing to share your writing with another and to share the ACTUAL writing with another — so rare and a glorious idea. Bless you both in this wonderful endeavor.